Hello. Have you heard of Mary Rodgers' Once Upon a Mattress? 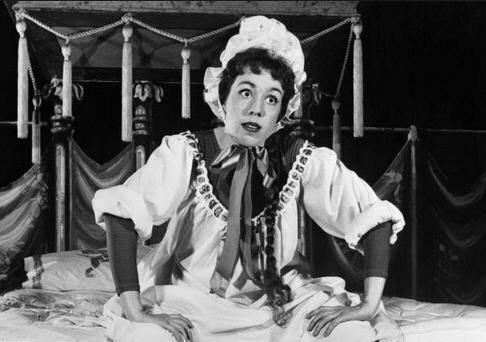 It premiered on Broadway in 1959 starring Carol Burnett as Princess Winifred. The musical is a popular choice for high school productions and is a delicious comedy with some great comedic numbers including "Shy", "Sensitivity", Happily Ever After" and "Man to Man Talk". Carol Burnett in Once Upon a Mattress (1964). A fun bit is that in 2005 as part of The Wonderful World of Disney they included a studio filmed version of Once Upon a Mattress starring Carol Burnett as The Queen, another role she excelled at. Is there anything she can not do? "getting married today" is a hoot. i hope you get to enjoy a musical sometime soon! It premiered 60 years ago... the year I was born ! I love Carol Burnett in just about anything. My daughter was in Once Upon a Mattress last year. It's a fun play.